Dream. Dress. Play. : Make It Monday! Magnetic Cat Toy For The New American Girl Cat! Make It Monday! Magnetic Cat Toy For The New American Girl Cat! 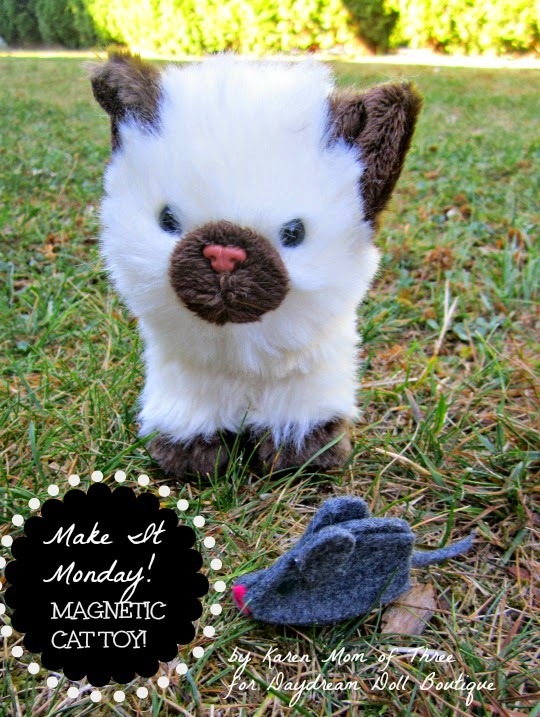 I am really excited to share today's Make It Monday craft. Last week my husband picked up the new American Girl cat from the Vancouver American Girl Store for my Niece. My sister said that I could play with the cat and review her first before sending her to my niece in Montreal so I set off to make her cat some cat toys to include when my dad goes to visit them next week. 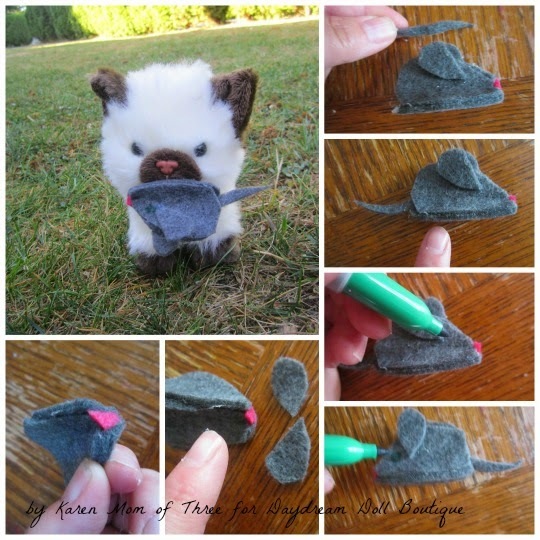 This cat toy is easy to make and the magnetic cat can hold the mouse in it's mouth! Step 1- Assemble all your supplies. Plug in your hot glue gun. Step 2- cut out three tear shape pieces of grey felt as shown in the photo above. They only need to be as long as your paper clip. Step 3- Use your glue gun to glue the paper clip or coin into place. Step 4- Run a line of glue along the outside edge of the tear drop shape and add another tear drop shape felt piece, pressing gently as you go along the glue edge. Step 5- Repeat on the other edge and add your other piece of felt. Step 6- Add a line of glue between the open edges of your felt sides you just attached and pinch them closed. leave open the ends for the nose and tail. Step 7- Cut a small pink triangle for the mouse nose from your felt, add a dab of glue and gently press it into place. Step 8- Cut two smaller tear shaped pieces of grey felt for the mouse ears, add glue to each side and press them into place as shown in the photos above. Step 9- Cut a small think strip of felt for the tail, I used grey but you can use more pink if you like. Step 10- Use a marker to make an eye on either side of your mouse. Now your mouse is ready for your dolls cat to play with! 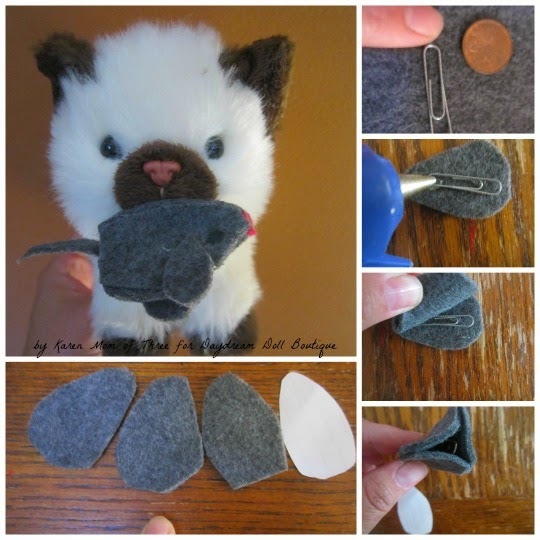 Even if you do not have a magnetic cat you can still make these little mice to use with your stuffed animal cats. Just leave out the paper clip! I hope you enjoyed today's Make It Monday Craft!